Washington, DC - The U.S. Botanic Garden (USBG) presents a new exhibit You Can Grow It! from February 18 through October 15, 2017. 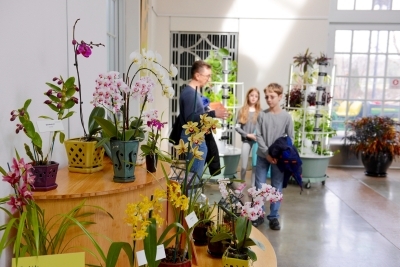 The indoor and outdoor exhibit showcases tips and answers to some of the questions visitors ask most frequently about how to care for plants in their own homes and gardens, including how to choose the best plant for their space and care abilities. The exhibit will provide answers to common issues about lighting, watering, fertilizing, and pests, as well as how to rescue a plant that experiences problems. For those unsure of what kinds of plants they can grow where they live, visitors can find tips based on which direction their window(s) face in a four-panel "house" diorama. "No one is born with a green thumb," said Ari Novy, executive director. "Gardening is life-long learning leading to an ever-greening thumb, and plants, over time. Through You Can Grow It!, the U.S Botanic Garden is excited to share our horticultural expertise. This exhibit will provide valuable tips for expert gardeners and beginners alike to keep the plants in your life healthy and beautiful." The Conservatory gallery will feature separate sections with tips on topics such as foolproof plants (for those with a less-than-bright-green thumb); today's popular succulents; tropical house plants; seasonal plants like amaryllis, Christmas cactus, poinsettia, and more; expert care tips on orchids, carnivorous plants, and others; how to propagate plants from seeds and cuttings; and even hydroponics. Outdoors, You Can Grow It! will showcase plants for growing outdoors including items for kitchen use like herbs and vegetables, container gardening, and more. Throughout the exhibit run, the USBG will offer programs, workshops, lectures, tours, and cooking demonstrations to showcase and provide training on gardening at home. Visit www.USBG.gov/YouCanGrowIt to learn more about the exhibit and associated programs.